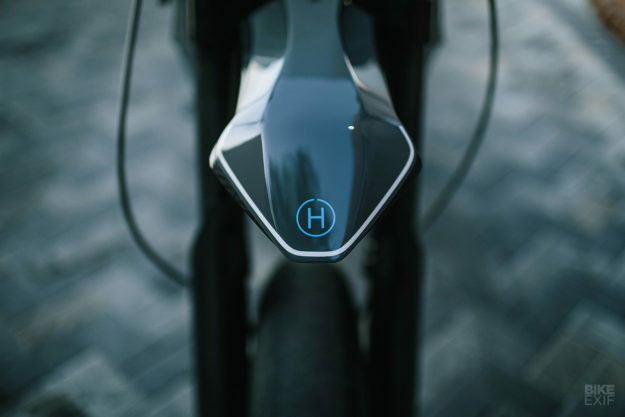 There’s a definite style to a Hazan Motorworks bike: a hint of steampunk, lots of beautifully twisted and burnished metal, and impossibly elegant proportions. 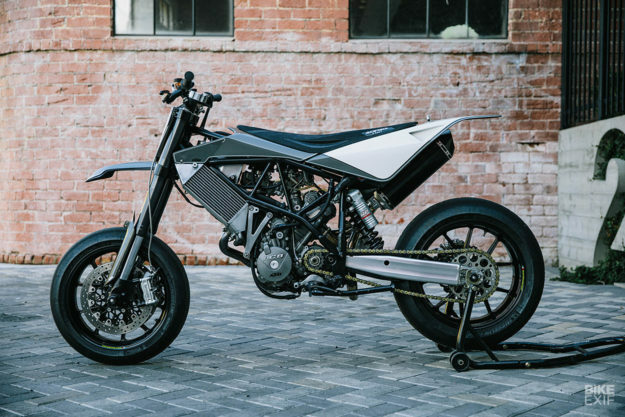 It’s an expensive endeavor, and Max operates in the same rarified atmosphere as Ian Barry of Falcon and the Japanese moto-artist Chicara Nagata. Luckily, there are collectors and museums that have the funds to commission bikes like this, so the rest of us can enjoy them vicariously. But what happens when Max builds a bike for himself, with his own money? 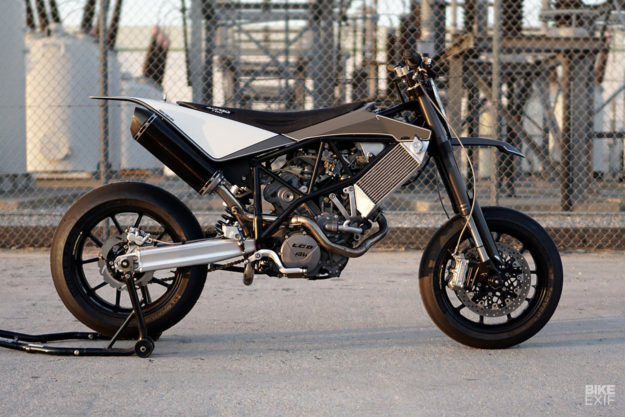 This KTM is the answer. 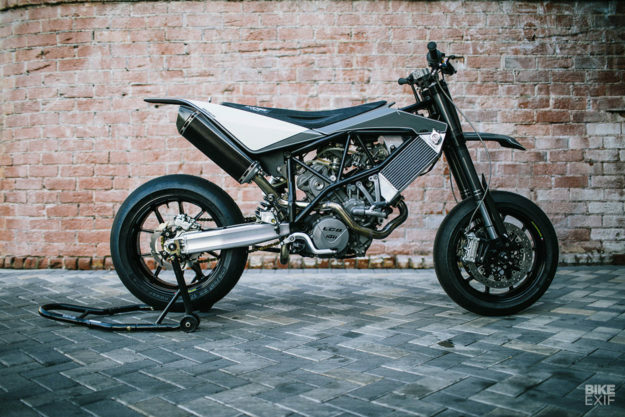 It’s a far cry from his previous KTM build, the supercharged 520 that now resides in the Haas Motorcycle Gallery in Dallas. But it’s a killer track machine, and just the thing Max needs when he wants to blow off steam. 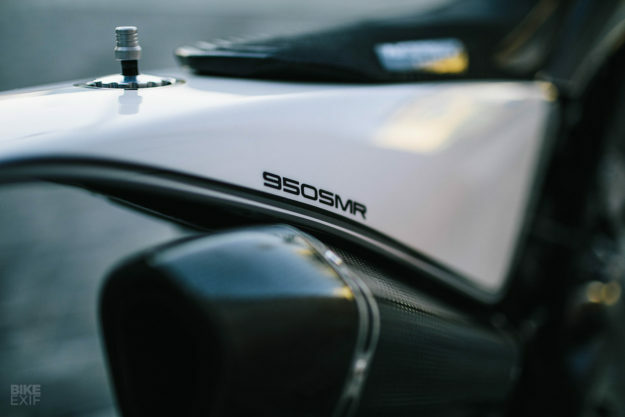 The base is a 2005-spec 950 SM. 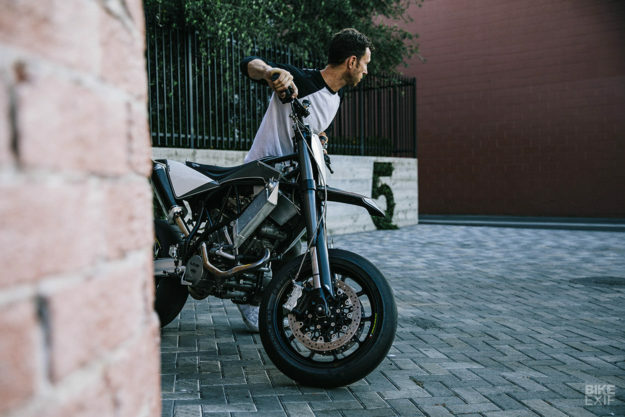 It’s a tall bike—which suits Max’s lofty physique—with around 98 horsepower in stock trim, 17-inch wheels, and a dry weight of just 191 kilos (421 pounds). Contemporary road testers raved about the performance and fun factor. 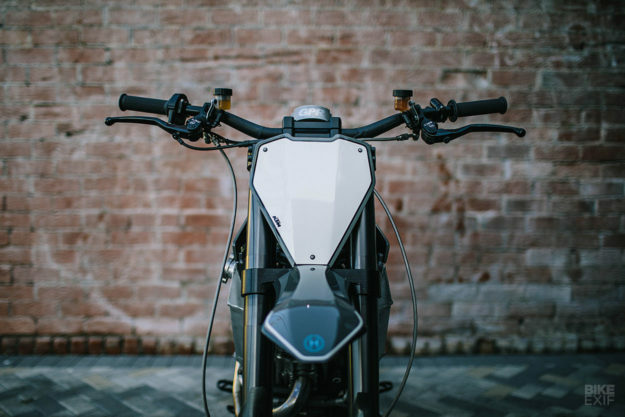 Stylistically, it’s no flight of fancy: just a well-sorted bike with terrifically simple bodywork and a sophisticated warm grey and white paint scheme. 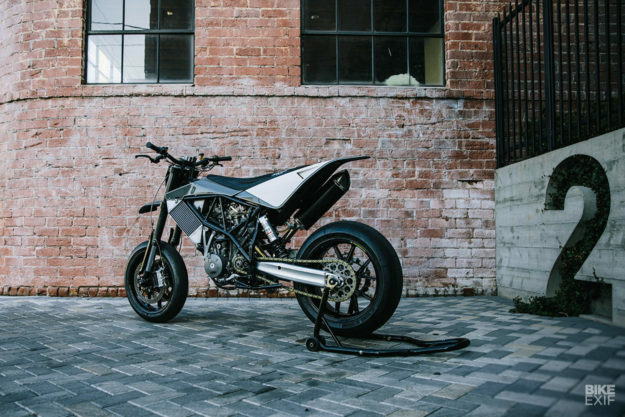 “I wanted the bike to look ‘factory’,” says Max. 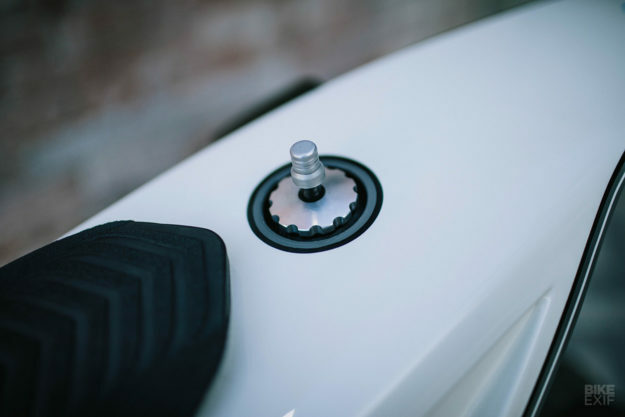 Since Max was building the KTM out of his pocket, he plumped for a set of magnesium Marchesinis from a CBR1000 race bike. The sizes are 17 x 6 and 16.5 x 3.5, and Max has machined the hubs, carriers and cush drive to squeeze them into the swingarm and forks. The 950 SM frame and swingarm are mostly stock, but Max has relocated the top shock mount forward and downward to raise the rear of the KTM by 2.5 inches, reducing the rake. Pretty much everything else has been modified or built up from scratch. 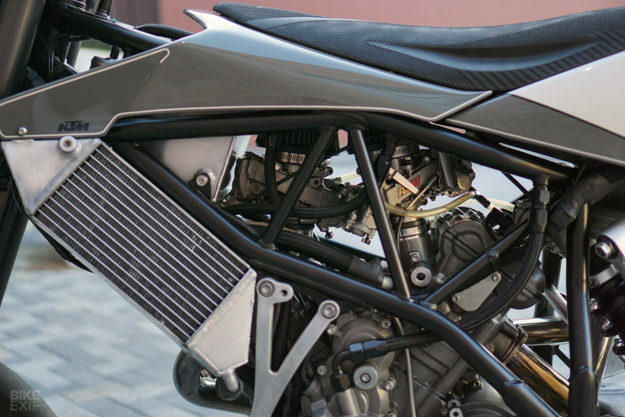 New radiator cores were modified from the oversized units from a 520, which Max tweaked to work with the twin’s cooling system—aided by air ducting. 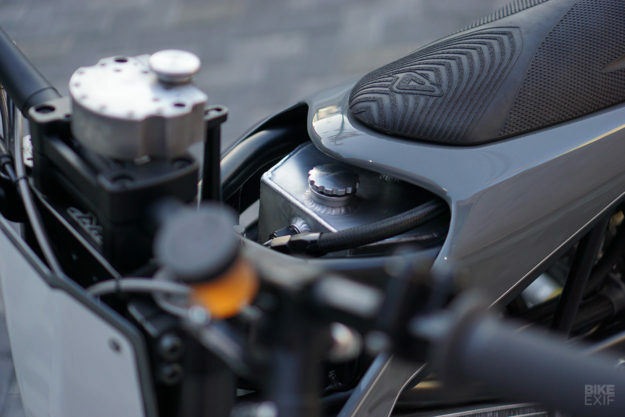 The oil tank on a 950 SM is located in front of the engine, below the radiator. Max has made an aluminum replacement that sits where a normal fuel tank would be, and although it looks small from above, it holds more than the stock tank. It’s certainly a looker. 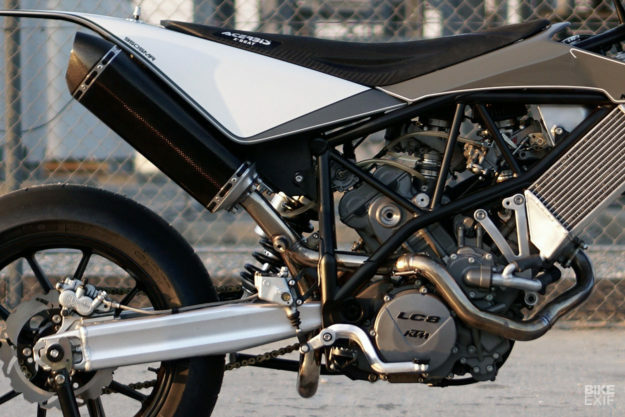 But unlike many customs from premier league builders, Max’s KTM offers visceral as well as visual pleasures. 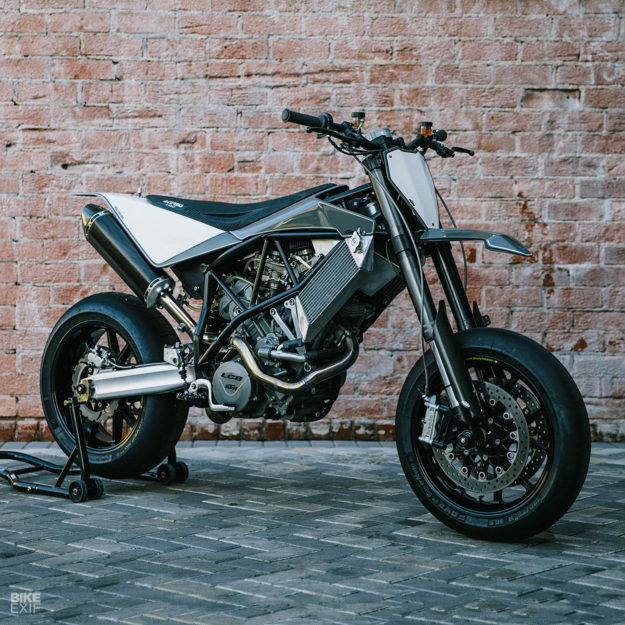 We can’t imagine Max releasing a kit version of these mods, but if you have one of KTM’s big supermotos in your garage, there’s a ton of inspiration to be gained right here.